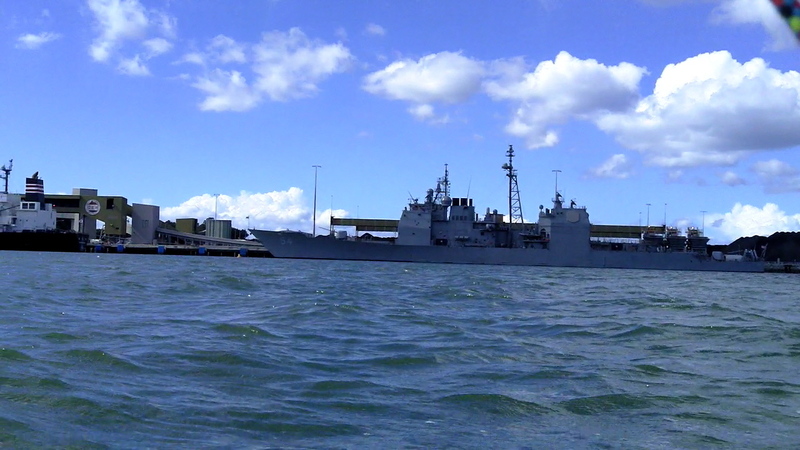 David rang and asked if I wanted to have a look at the US Aircraft Carrier berthed at the port. We arranged to meet at 11:00am Wednesday, hoping the ship and its entourage would oblige. I arrived at 10:00, David was already there, so following the new SEQSK lead, we left the Boat Passage 1/2 hour before the announced time. We passed under Port Drive, as we approached the main channel it was on. The flashing lights had us in their sights. 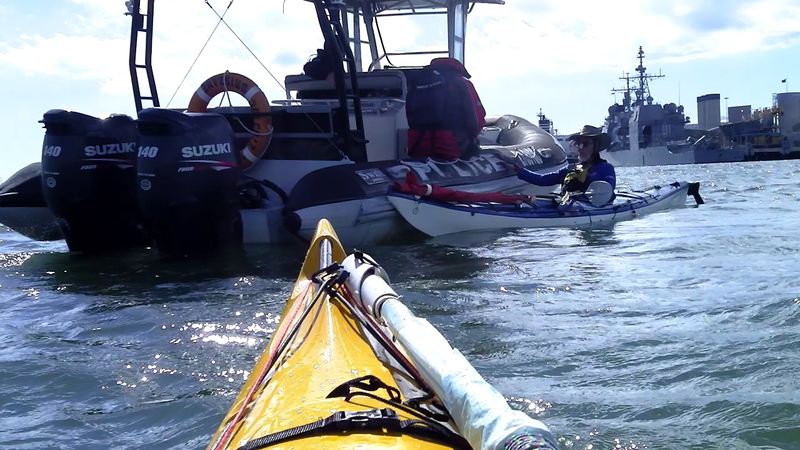 As it slowed up around 20m from us, David asked if the two officers had thrown in a line. No reply. Okay. Maybe they didn’t hear, so out with fishing crack number 42. Strike. One officer gestured David to approach. The interrogation began with a demand for ID. And yes, no one was spared the privilege. 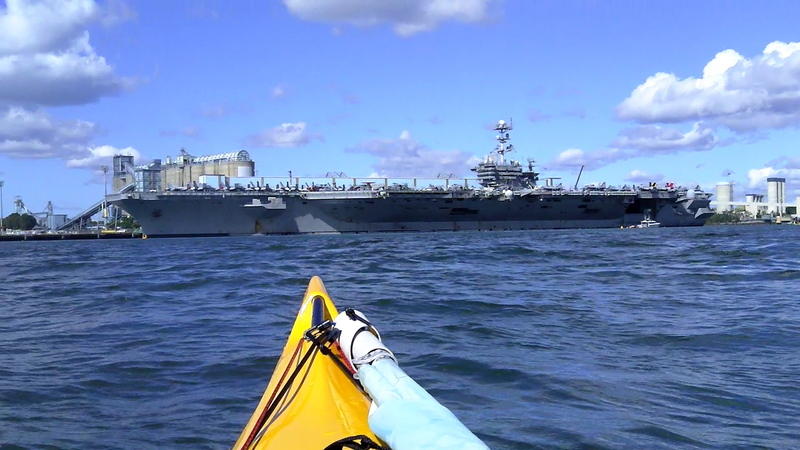 We were over 500m from the Nuclear Powered Aircraft Carrier ‘USS George Washington’ and about 250m from the Guided Missile Cruiser ‘USS Antietam’. I don’t know who the officers were, what the had done, or why we were questioned. Maybe, like Ron Steele, they just didn’t appreciate David’s humour. We were instructed to cross the channel and remain on the opposite side, as the mandatory 150m would have landed us in the middle of the channel. Up went my sail as we headed across the river. The 10kn SW and busy traffic made the river annoyingly choppy and difficult to photograph or video. Around 100 people were on the North bank of the river taking photos. 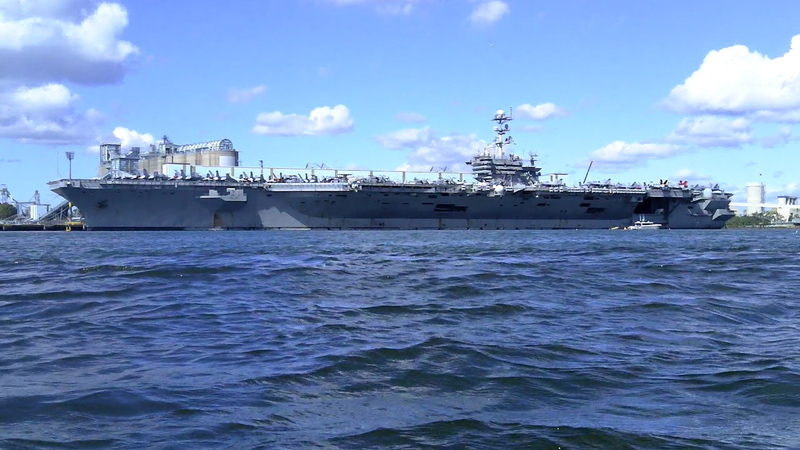 We watched the crew of ‘USS George Washington’ raise and lower fighter planes between decks. 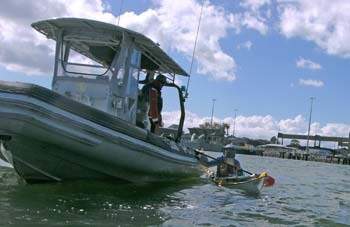 Port security and police vessels were constantly moving around the carrier, yet no other recreation craft appeared to be stopped or questioned. Maybe it was David’s humour! 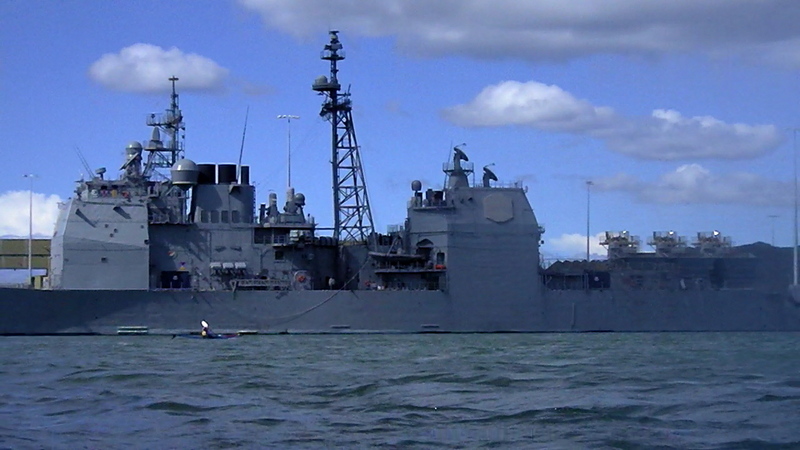 On the return journey, David decided to have a look at the smaller Guided Missile Cruiser ‘USS Antietam’ which was berthed near the coal terminal. 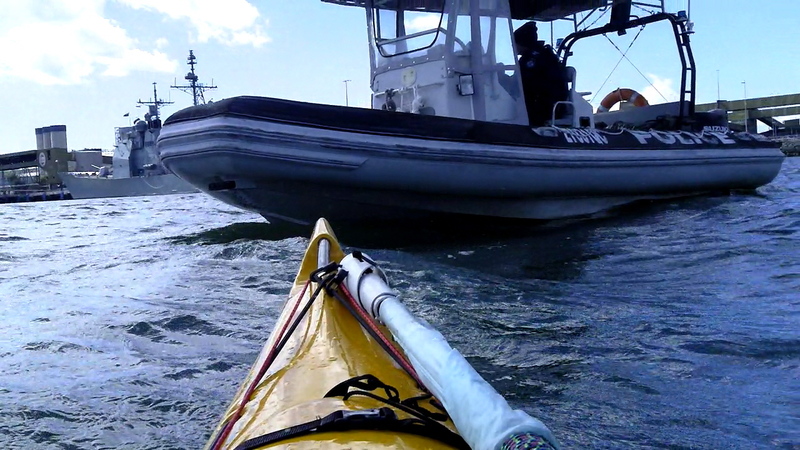 His every paddle stroke was haunted by a rifle toting US Navy crew member until he was well clear of the vessel. 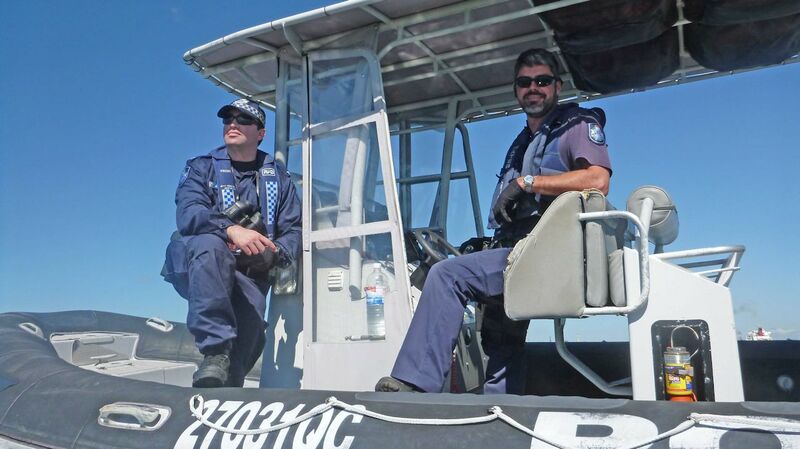 Thereafter it was a hassle free return passing by the water police headquarters to the familiar domesticity of the highly scrutinised Boat Passage.